Can you describe In The Moment magazine? Who is it for and what is its mission? A beautiful, practical lifestyle magazine for the modern-thinking woman, In The Moment focses on four key editorial pillars: Wellbeing, Creativity, Living and Escaping. The magazine touches on many aspects of life with a positive message (our news pages are called ‘GoodNews’!). It offers thoughtful features and expert advice on wellbeing and mindfulness reflecting current ideas, beliefs and trends on these topics. Practical and lighthearted columnists feature in each section, alongside discerning product pages and regulars on relationships and real people. Encouraging creativity as a means of mindfulness is cornerstone of the magazine. Our unique card inserts offer instant easy makes to enjoy, while readers can pop our mini magazine into their handbag for a short story and enjoyable puzzle. It's the little extras that add value to each issue our readers love! Lifestyle choices, food and interiors are the focus for the Living section – all with a natural and healthy perspective, embracing current innovation and ideas. Our Escaping section is not just about travel (although we love it, of course!). It’s about freeing yourself from your daily routine to allow space to refresh – as well as stimulate – your mind and body. Think retreats, adventures, unusual places and inspiring people. Entertaining, informative and a great companion, this new publication is a mindfulness and wellbeing magazine for all ages. How can we be more ‘in the moment’? We can stop multitasking so much, we can really pay attention and listen to people when we’re having conversations, we can eat our lunch while doing nothing else but savouring the smell, taste and texture of what we’re eating. Achieving everyday mindfulness (another feature in issue 1!) is about creating personal rituals for yourself that you can use to focus on what is happening to you in the present (so your mind isn’t wandering through your To Do lists or planning dinner for tomorrow). And it really does make you happier, because you simply reap more pleasure from the things you do. Our lives are dominated with social media and technology these days, do you think tech and mindfulness are at odds? Or can they complement each other? All the bad news in the media can be overwhelming, do you see this magazine as an antidote to that? Absolutely! That’s why we’ve called our news pages 'Good News' and with a strap ‘Uplifting ideas, stories and inspiration from around the world’. Our aim is to show our readers that there is plenty of goodness and positivity all over the world, so they can feel empowered to do something good for others too. When people feel like they can make a difference, it’s very uplifting and can be rewarding in many ways. What is your number one stress-busting tip? Do something outdoors, whatever the weather. The combination of doing something physical and observing nature means your body feels good and at the same time your mind is able to achieve perspective (does that ‘problem’ really matter in the scheme of things?). I like to walk or go rowing; I learnt to scull last year and it’s a wonderful feeling to be out on the river, seeing everything from a different viewpoint and listening to the birds and water. What do you think readers are going to love most about In The Moment? 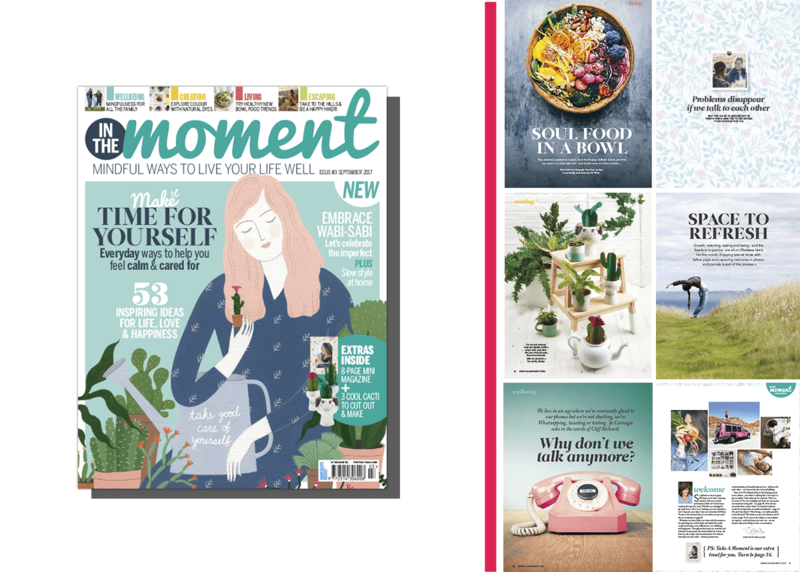 In The Moment is different from other magazines out there: it’s got a great, positive, international vibe to it; it feels modern and fresh and it’s beautifully laid out with gorgeous illustrations and images. If In The Moment had a motto what would it be? Our ‘strapline’ is 'Mindful ways to live your life well’. And ‘make the most of every day’ is a good way to do this. To check out our current subscription offer click here.